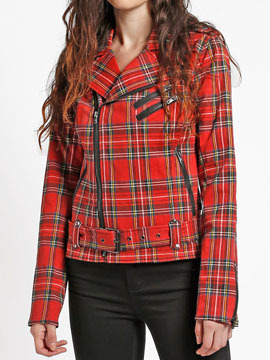 Tripp NYC Wild Child womens long sleeve zip front motorcycle jacket features soft stretch fabric in an all over tartan plaid pattern with two accent zippers on chest and two side zipper pockets. This jacket has moto detailing with zip front closure, zipper pockets and sleeves, snap lapels and adjustable belt. 97% cotton 3% spandex. Machine wash, lay flat to dry. Color: red plaid.